Wide Range of Models and Sizes The T-Max line of autoclaves is designed to comply with the European EN285 standard with chambers designed for StU (Sterilization Unit) load volumes. Tuttnauer also builds customized configurations to adapt to a customer’s site. All models are available with either single or double doors. 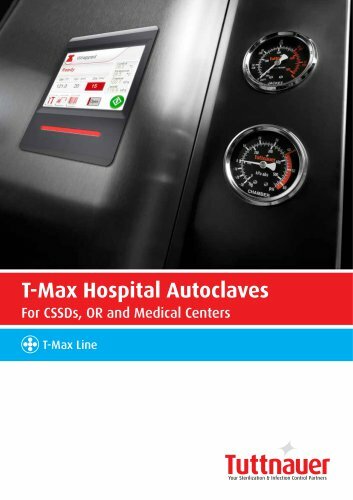 T-Max Large Capacity Series 9 to 15 StU Capacity T-Max Large Capacity Series Hospital Autoclaves have chamber volumes ranging in size from 800 Liters to 1300 Liters (9 to 15 StU) and are available with a fully automatic horizontal sliding door. Horizontal Sliding Door Chamber Dimensions (WxHxD) mm Chamber Volume (Liter) Dimensions may change to meet facility layout requirements.